The Jazz Singer is built around a lot of preconceptions based on what people think it is rather than what is actually on the screen. People think it is the first sound film (it is not). People think it is a racist film (it is not). People think it's all Al Jolson in blackface belting out Mammy (it is not a major part of the story, though still understandably uncomfortable now to say the least). I think many people think they know The Jazz Singer, but in reality the film itself is far from the perceptions that have been built around it. Cantor Rabinowitz (Warner Orland) is the fourth generation of cantors in his family, singing sacred songs for his Jewish congregation. He expects his son Jakie to follow and be the fifth generation. Jakie, who is the first generation born in the new country of America, has other dreams. He loves that ragtime and rather than sing the Kol Nidre on Yom Kippur, he'd rather be down at the dance halls belting out that new music. Cantor Rabinowitz is outraged by this and he is determined to whip Jakie into submission, but Jakie won't be denied. He runs away, taking with him only a photo of his beloved mother (Eugenie Besserer). Many years pass, with the Cantor insisting he has no son, Mrs. Rabinowitz always hoping for her little boy to come home, and Jakie, not going by the improbable name 'Jack Robin', finding some success belting out such numbers as Toot, Toot, Tootsie. He attracts the attention of a local troupe, and of its star Mary Dale (May McAvoy), who asks him to join the troupe. He is having wild success, but he still misses his parents, especially his mother. He secretly writes to her, and while she's happy, she's also concerned that her little boy is falling for a shiksa. An unexpected bit of luck comes his way when his tour is unexpectedly cancelled...so that he can go onto a major Broadway review. This would reunite him with both Mary and give him a chance to see his parents and perhaps reconcile with his father. He goes up to the Lower East Side and tearfully reunites with his mother. He tells her while singing a song he'll perform on Broadway, Blue Skies, that if he's a hit, he'll move them up to the Bronx where she'll meet the Goldbergs, the Ginsbergs, 'a whole lot of Bergs'. In comes in Cantor, and is appalled by this...jazz singer. The break between Rabinowitz and Robin appears permanent. Then comes a great crisis: Cantor Rabinowitz takes ill, dying really. Mrs. Rabinowitz and family friend Moisha Yudelson (Otto Lederer) beg Jack Robin to come and perform for Yom Kippur, but that would mean leaving the show just as he's about to make his Broadway debut. Eventually, he makes his decision, reconciling with his father who sees that he was born to be a jazz singer. Years pass by, and Jack Robin, true to his word, is caring for his widowed mother as his name lights up the Great White Way. He sings his heart out, belting out My Mammy triumphantly. Watching The Jazz Singer, it is surprising that for the most part, it is not a sound film. What it is instead is a silent film with sound sequences. 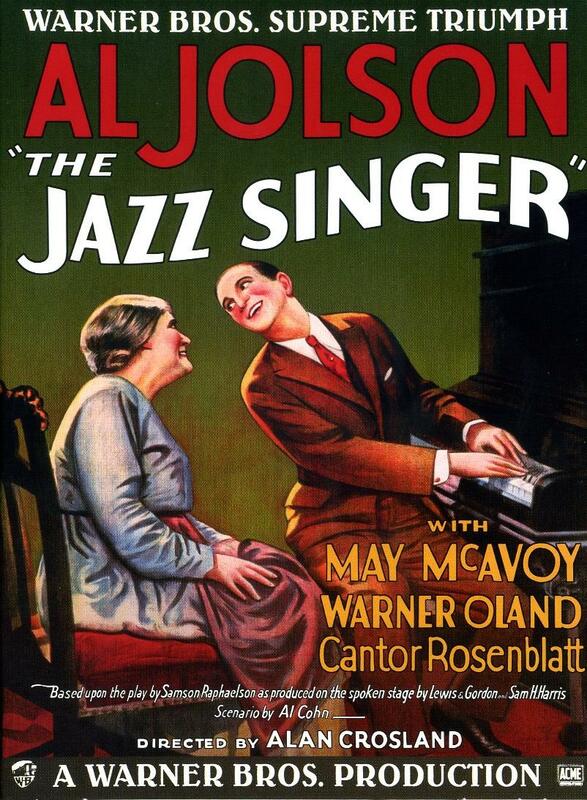 Most of the sound comes from Jolson's musical performances, but the importance in The Jazz Singer is that in between the numbers Jolson includes bits of dialogue and adlibs. The first actual words heard were 'Wait a minute, wait a minute. You ain't heard nothing yet! ', as prophetic a statement as ever there was in cinema. The Jazz Singer showed how dialogue can work in films, and for all intents and purposes it was the beginning of the end of silent films. Pity that silent films were essentially discarded after the wild success of The Jazz Singer. I think that people who have not seen The Jazz Singer would be surprised that it is really mostly a silent film with synchronized sound effects and music. As such, it has some of that silent movie acting, but for the most part the acting is quite effective. I think that modern audiences will laugh at Jolson, but not when he is acting in the silent parts. Instead, it's whenever he's singing that he seems wildly exaggerated, his eyes bulging out and his dancing so comical. However, as an actor Jolson did a pretty solid job when he wasn't gyrating and showing an exuberance. I think the best performance was Besserer, who fits the ideal of My Yiddishe Mama. I confess to being moved at the scenes of her and Jolson as they tearfully reunite. Granted, at the Cantor's death she seemed over-the-top, but on the whole Besserer was almost cuddly as the Jewish mother we all had or wish we had. Orland's performance too gave a rather one-dimensional role a bit more heart as the disapproving father, especially at the end when as a ghost he 'blesses' his prodigal son come home to honor his heritage. McAvoy is beautiful as the potentially shiksa girl (whether she is actually Gentile or Jewish is not answered), but unlike Jolson or Orland, we never hear her speak, making one wonder about her own voice. Now let's look at the more controversial aspect of The Jazz Singer: the blackface. 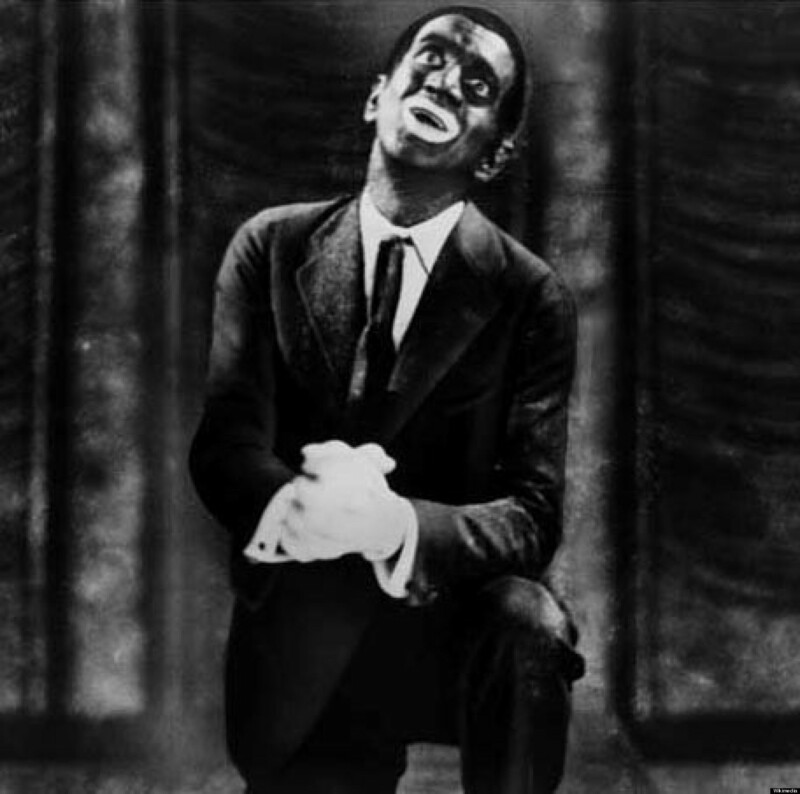 I think many people may think that Jolson is just there ridiculing African-Americans or portraying them in a negative light. Now, blackface is not acceptable now and should not have been acceptable then, but the actual blackface did not play a major role in the film. In fact, it isn't until the end of the film that he dons the infamous makeup, and in both cases it is to sing songs, curiously both related to mothers: Mother of Mine and more notoriously, My Mammy. I think in this case, the perceptions are more damning than the actual reality. The blackface looks ghastly and is understandably troubling, but given some of the really horrific images of African-Americans in films prior and post-Jazz Singer, it is quite tame. It does not make it right, but I think context is important. An aspect of The Jazz Singer that I don't think gets enough discussion, probably due to the blackface aspect, is how the film is more about the conflict between the older generation from the old country with their native-born children. At one point, 'Jack Robin' tells his father that if he'd been born here, he would understand. The Jazz Singer is really more about the immigrant experience in general and the Jewish experience in particular; it's about that struggle between the idea of keeping to tradition and the customs of the ancestors as epitomized by Cantor Rabinowitz and joining the dominant American culture as epitomized by his son. Even his name change from the very Jewish-sounding Jakie Rabinowitz to the more goy 'Jack Robin' reflects a truth about Jewish and Jewish-American life, one that is more real than something as heavy-handed as Gentleman's Agreement. In terms of history, The Jazz Singer is important, though misconceived as either the first sound film or a virulently racist film when it is neither. It's well-acted, with a universal story, even if it is easy to parody. It's a film of its time (as a side note, the two remakes I think fail to understand that 'jazz' was the in-thing, so using it in the title of the 1952 & 1980 remakes is a mistake) and better than what people may think it is. There is only one thing that The Jazz Singer is both in myth and reality: after this film, it was clear that we ain't heard nothing yet.